Finland won the 2018 European Men’s Amateur Team Championship, comfortably beating England 5-2 in today’s Final. Finland were only promoted from Men’s Division 2 last year but with Matias HONKALA and Sami VALIMAKI in their ranks, both of whom were selected for the Continent of Europe St. Andrews Trophy Team this week, they proved to be more than a match for the English. England will be disappointed with their performance. Having previously won the Championship 11 times and given their play so far this week they would certainly have expected to win. Finland won both morning Foursomes to give themselves the platform for their victory. Whilst the five Singles were all tight at the end of the day only Gian-Marco PETROZZI was able to secure a win. Also in Flight A Scotland lost to Sweden 3-2 and therefore finished 8th. Ryan LUMSDEN and Jamie STEWART won their Singles games, overcoming Pontus NYHOLM (2&1) and Tim WIDING (1 Hole) respectively. Ireland lost 2-3 to Netherlands to finish 10th in the European Men’s Amateur Team Championship. Robin DAWSON and Rowan LESTER secured Ireland’s two points with Singles wins against Vince VAN VEEN (4&2) and Dario ANTONISSE (1Hole) respectively. England narrowly beat Denmark 4-3 to secure a place in tomorrow’s Men’s Final. A dream start saw the team take a 2-0 lead after the morning Foursomes. Matthew JORDAN and Gian-Marco PETROZZI beat the in-form Hojgaard twins 4&3 while the Yorkshire pairing of David HAGUE and Nick POPPLETON critically secured another point on the first extra hole of their match. Playing number 1 Matthew JORDAN won his Singles match against the European Amateur champion Nicolai HOJGAARD. This was Matthew’s fourth win out of four games in the match play stage. Mitch WAITE secured the all important winning point beating Rasmus HOJGAARD on the 19th hole. Waite hasn’t been used in the Foursomes to date but has now delivered two hard fought Singles wins. In a change to yesterday’s Quarter Final line up Nick POPPLETON came in for David HAGUE in game 5. Nick lost the first four holes against Morten TOFT HANSEN and was unable to recover any of this early deficit with the match coming to a close on the 15th green. It will be interesting to see if David HAGUE comes back into the Singles line up in the Final. England will face Finland who had a similar game against Germany to that of England’s. 2-0 up after the Foursomes before losing the afternoon Singles series 3-2. Aleksi MYLLYMAKI securing the all important point in the last game against Michael HIRMER with a 1 Hole victory. Germany will now play Denmark in the Bronze medal match tomorrow. Scotland lost 1.5-3.5 to France in their Flight A match. Jamie STEWART enjoyed a good 4&3 win against Adrien PENDARIES whilst Sandy SCOTT halved his match with Jeremy GANDON. Ireland beat Iceland 3.5-1.5 as they seek to regain some pride. Alex GLEESON and Caolan RAFFERTY won their Foursomes before Robin DAWSON and John MURPHY both secured 3&2 wins. England beat France 6-1 to secure their place in the European Men’s Amateur Team Championship. The score line flattered England a little as most of the games were tight affairs. As one can see from the results below it was a good all round team effort for England with all six members battling hard and contributing positively to the final result. Denmark, who finished 3rd in Stroke Play Qualifying, proved too strong for Scotland in their Quarter Final match. Singles wins for Ryan LUMSDEN (3&2 over John AXELSEN) and Euan WALKER (3&1 over Andreas HILLERSBORG SORENSEN) and a half for Sandy SCOTT (with Gustav FRIMODT) gave the scoreline some respectability. As expected Ireland beat debutants Serbia 5-0. The highlight in a understandably one sided match was Robin DAWSON’s 8&7 victory over Mihailo DIMITRIJEVIC. England (-27) finished 2nd and Scotland (-11) 6th to make the 8 team Flight A Match Play segment of the European Men’s Amateur Team Championship. Gian-Marco PETROZZI secured individual medalist honours with a -12 total. Euan MCINTOSH (-4) was the best placed Scot in 14th place. Ireland finished 9th unable to improve on their position after Day 1. As a result they will play in the Flight B Match Play section. As can be seen from the scores below John MURPHY once again performed admirably and given his recent form must now be a very strong candidate for a St. Andrews Trophy spot. England (349 / -11) lead the European Men’s Amateur Team Championship Stroke Play Qualifying after Day 1. By way of reminder each nation has 6 players with the best five scores counting towards their team score. Gian-Marco PETROZZI shot a superb 62 (-10) to lead his team to a 2 shot lead over Sweden. Matthew JORDAN, with a 69 (-3), was the only other England player to shoot under par in Round 1. Scotland, led by Sandy SCOTT who posted a 69 (-3), are 7th on 357 (-3). Ireland, who were helped by strong rounds from both Robin DAWSON 67 (-5) and John MURPHY 68 (-4), are 9th on 359 (-1). The aim for all three of our teams will be to finish the 36 hole Stroke Play Qualifying in the Top 8 to ensure they make the Match Play Flight A. This will then give them a change to win a medal. The 35th European Men’s Amateur Team Championship will be played between Tuesday 10th and Saturday 14th July 2018 at Golf Club Bad Saarow, Brandenburg in Germany. Amateur teams from England, Ireland and Scotland will all be competing this week. Spain are the defending champions having won at Diamond C.C. in Austria last year. The European Men’s Division 2, Ladies’, Boys’ and Girls’ Team Championships are also being played elsewhere in Europe this week. I will provide daily updates on play on this website during the week and score links to all of the Championships on Twitter. 16 national teams of 6 players contest the European Men’s Amateur Team Championship. The teams competing in the 2018 Championship are Austria, Czech Republic, Denmark, England, Finland, France, Germany, Iceland, Ireland, Italy, Netherlands, Portugal, Scotland, Serbia, Spain and Sweden. Belgium, Switzerland and Wales were relegated last year while Norway, who finished 8th, have decided not to compete this year. Finland, Portugal, Netherlands and Serbia were the top 4 finishers in the 2017 Division 2 Championship. ENGLAND – Todd CLEMENTS, David HAGUE, Matthew JORDAN, Gian-Marco PETROZZI, Nick POPPLETON and Mitch WAITE. IRELAND – Robin DAWSON, Alex GLEESON, Rowan LESTER, John MURPHY, Caolan RAFFERTY and Jonathan YATES. SCOTLAND – Stuart EASTON, Ryan LUMSDEN, Euan MCINTOSH, Sandy SCOTT, Jamie STEWART and Euan WALKER. From our three teams just Robin Dawson, Matthew Jordan, Ryan Lumsden and Jamie Stewart played in last year’s competition in Austria. The Championship is run by the European Golf Association, this year in partnership with the German Golf Association. Assuming no withdrawals the leading 13 teams from last year’s Division 1 Championship are joined by the host nation (if not otherwise qualified) and 2 or 3 promoted teams from the 2016 Division 2 Championship. Two rounds of stroke play qualifying are completed on the first two days, with the lowest five scores from each team counting. These results determine a seeded match play draw. The top 8 qualifying teams will play in a first flight, which will determine the medalists, with the others competing in a second flight. In Fight A it is therefore 1st v. 8th, 2nd v. 7th, 3rd v. 6th and 4th v. 5th. Additionally the teams finishing 14th to 16th in the match play stage will be relegated to the Division 2 Championship for 2019. The teams in Flight A play 2 foursomes and 5 singles whilst those in Flight B play 1 foursome and 4 singles. A win earns 1 point, a draw half a point and a loss no points in all of the matches. The Faldo Course Berlin is generally accepted as being one of German’s best golf courses. Located 70 km outside of Berlin the Faldo Course was opened in 1997 and is a manufactured links-style course. It has few trees, plenty of pot bunkers, a burn and some interesting contoured greens. It plays to 7,093 yards and a standard par of 72. Both nines are similar in length and have the same make up of holes. Some wet weather is forecast in Germany for each of the first three days of the Championship but things are expected to warm up later in the week. Very little wind is forecast on this inland venue. Tue 10th July – Showers. Wind 4 mph W. Temp. Min. 13°C / Max. 19°C. Wed 11th July – Rain. Wind 6 mph W. Temp. Min. 14°C / Max. 20°C. Thur 12th July – Rain. Wind 9 mph NW. Temp. Min. 15°C / Max. 23°C. Fri 13th July – Sunny. Wind 10 mph NW. Temp. Min. 15°C / Max. 28°C. Sat 14th July – Sunny. Wind 8 mph NW. Temp. Min. 15°C / Max. 27°C. The European Men’s Amateur Team Championship was first played in 1959. It was played every second year until 2007. Since then it has been played annually save for 2012 when no Championship was held. To date England have won 11 times, Scotland 8, Ireland 6, Spain 3, Sweden 2 and Wales, Italy and France once each. 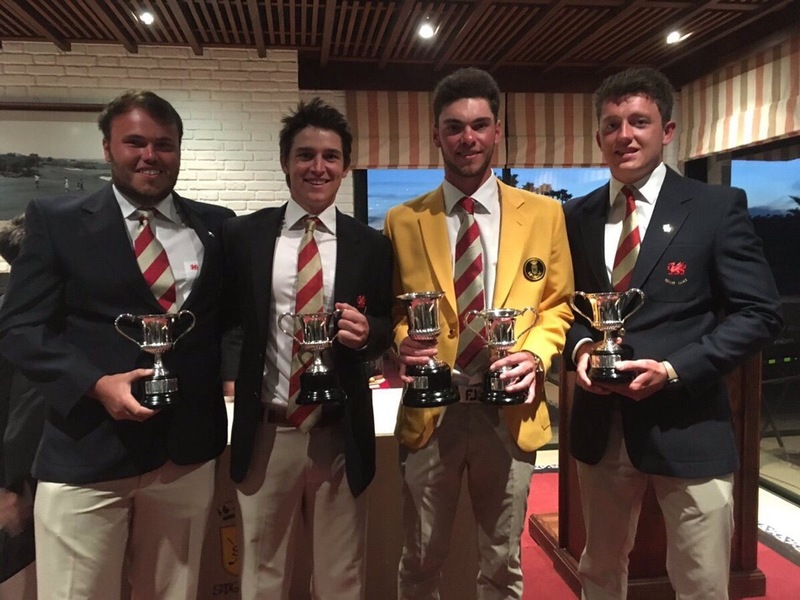 ENGLAND lost 4-3 to Spain in the Final of the 2017 European Men’s Amateur Team Championship at the Diamond C.C. in Austria. SCOTLAND secured 5th place with a 3-2 win over France. IRELAND finished 7th after a 3-2 win against Norway on the final day. WALES lost their final Flight B match 3-2 to Switzerland and were sadly relegated in 16th and last place. ENGLAND (-8) finished 1st in the 36 hole stroke play qualifying event where the 5 best scores from the 6 man team’s counted towards a national aggregate total. IRELAND (+7) and SCOTLAND (+15) also qualified for the Flight A match play stage finishing 5th and 6th respectively. WALES (+28) finished 10th and therefore played in the Flight B match play stage. The challenge then is always to avoid finishing 14th or lower to stay in Division 1. England beat France 13 – 7 in the 2018 Men’s International Match. With heavy rain forecast to start in the St. Tropez area around midday the decision was taken to cancel the Day 2 Foursomes series and to concentrate on completing the 8 Singles. England enjoyed a great team performance winning the Day 2 Singles series 6.5 – 1.5. This took them to a 13 – 7 lead and therefore meant the decision to cancel the four foursomes was pleasingly irrelevant to the overall match result. As you can see from the results below there were Singles wins for Matthew Jordan, Todd Clements, Andrew Wilson, Ben Jones, Bailey Gill and David Hague. Well done to the England team and in particular Ben Jones and David Hague who were both unbeaten in all three of their matches. 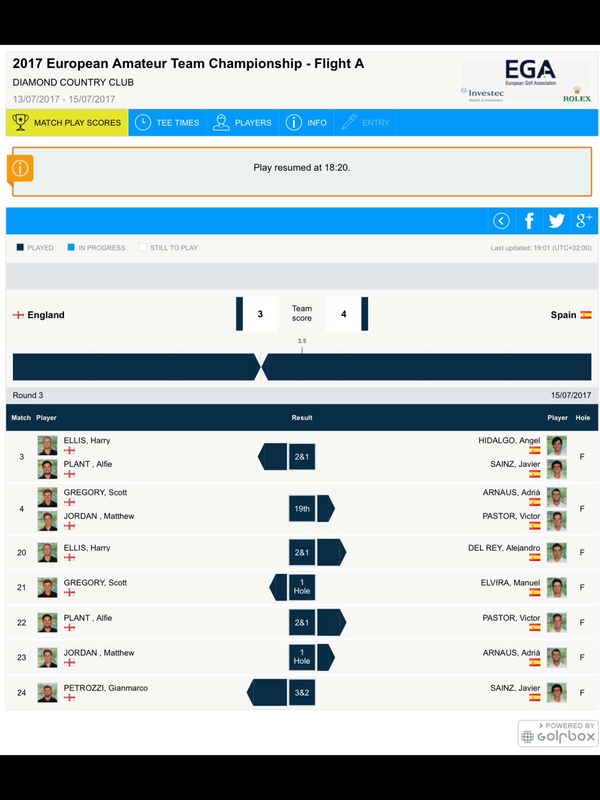 England lead France 6.5 – 5.5 after the first day’s play at Vidauban G.C. The morning foursomes were shared, two a piece. Matthew Jordan and Gian-Marco Petrozzi and Ben Jones and David Hague were the successful pairings for England. The afternoon singles also proved tight with England narrowly edging them 4.5 – 3.5. Ben Jones enjoyed the most convincing win, 7&5 over Jeong-Weon Ko. Gian-Marco Petrozzi and David Hague (both 4&3) also did well against Antoine Auburn and Paul Margolis respectively. Todd Clements picked up England’s fourth win battling hard for a 2Up win against Victor Veyret. Tomorrow will hopefully see a further four foursomes and eight singles so there is clearly still lots to play for. I say hopefully because forecast rain in the afternoon is expected to lead to some adjustments being made to the match format. England take on France this coming weekend in the 35th Men’s International Match between the two countries. This year’s match is being played at Vidauban Golf Club in South East France. 8 man teams from each country play 4 foursomes and 8 single matches on the two competition days. With a total of 24 points to play for the winning team needs to secure 12.5 points to win the match outright. As England won the 2016 match they will also retain the trophy in the event of a 12-12 tie. France is 1 hour ahead of the UK so play on Day 1 will start at 7.30am our time. England will clearly start the match as favourites as is normally the case. At this time of year, with a number of players still engaged in the US College Championship series, France simply don’t have the strength in depth. Vidauban Golf Club is an ultra-private club that was opened in 1999 on the hilly land around 10 miles north of St. Tropez. The site was originally acquired by the famous golf architect Robert Trent Jones Snr. in the late 1970s. Fraught with subsequent financial and planning issues a course was eventually designed on the land by his son Robert Trent Jones Jnr. Following recent renovation work the course is now established as one of Continental Europe’s finest. It is an undulating parkland track often compared with Spain’s Valderrama both in design and standing. Adam Lawrence briefly tells the story of Vidauban in an October 2016 article for – Golf Course Architecture Magazine. This International Match was first played in 1934, originally starting with 6 players aside before moving to 8 in 1950. It lapsed after the 1962 match at Ganton G.C. but was resurrected in 1982 at Chantilly with a new format which has been retained to this day. It has been played biennially ever since. Frilford Heath G.C., hosts of the 1984 match, donated a silver salver which the winning team retains. To date England have won 29 of the matches with France winning just 5, the last one being in 2010 at Chantilly. The England team back then consisted of Jamie Bower, Scott Gregory, Josh Hilleard, Paul Kinnear, Bradley Moore, Alfie Plant, Ashton Turner and James Walker. The overall match record is Played 34, England Won 29 and France Won 5. ENGLAND lost 4-3 to Spain in today’s Final of the European Men’s Amateur Team Championship at the Diamond CC in Austria. Whilst I am sure they are all disappointed the Silver Medal still represents a very good achievement for the English team. The two morning Foursomes were shared. Harry ELLIS and Alfie PLANT beat Angel Hidalgo and Javier Sainz 2&1 but Scott GREGORY and Matthew JORDAN lost on the 19th hole to Adria Arnaus and Victor Pastor. HARRY ELLIS lost the first afternoon Singles game 2&1 to Alejandro Del Rey. After a late afternoon 35 minute suspension in play due to the risk of lightning the remaining Singles were quickly resolved. Scott GREGORY beat Manuel Elvira by 1 hole but Alfie PLANT, losing his first game in the match play stage, lost 2&1 to Victor Pastor. Gian-Marco PETROZZI, playing in the final Singles game, won for the second day running beating Javier Sainz 3&2. This meant the match came down to the Matthew JORDAN and Adriá Arnaus game. Arnaus held on bravely to win by 1 hole to secure the title for the Spaniards. Earlier in the day SCOTLAND secured 5th place with a 3-2 win over France. Singles wins for Robert MACINTYRE (4&2), Craig HOWIE (4&3) and Conor SYME (3&2) won the match for the defending champions. IRELAND finished 7th after a 3-2 win against Norway on the final day. As with Scotland three Singles wins were responsible for the narrow victory. Stuart GREHAN (4&3), Conor O’ROURKE (3&2) and John Ross GALBRAITH (2&1) did the business for the Irish. WALES lost their final Flight B match 3-2 to Switzerland and were sadly relegated in last place. England won the Silver Medal, losing 4-3 to Spain in the Final. Scotland finished 5th, Ireland 7th and Wales 16th (R). Ireland finished 6th, England 8th and Scotland 13th. England beat Italy 5.5-1.5 to secure the Gold Medal. Ireland finished 9th and Scotland 11th. England beat France 5-2 to secure the Bronze Medal. Ireland were 10th and Scotland 14th. ENGLAND beat Italy 6.5-0.5 in their Flight A Semi-Final today. They will play Spain in tomorrow’s Final after they overcame Sweden 4-3 in the other Semi. England got off to a great start winning both of the morning Foursomes, perhaps helped by Italy choosing to rest their best player Luca Cianchetti. Harry ELLIS and Alfie PLANT (1 hole) paired up successfully as did Scott GREGORY and Matthew JORDAN (2&1). Gian-Marco PETROZZI came into the Singles line up and with all of the Foursomes players sent out again Josh HILLEARD ended up sitting out the whole day. The decision was vindicated as England delivered an unbeaten Singles series. ELLIS beat Cianchetti (1 hole), GREGORY halved with Lorenzo Scalise, PLANT beat Stefano Mazzoli (2&1), JORDAN beat Philip Geerts (4&3) and PETROZZI saw off Alberto Castagnara (1 hole). SCOTLAND beat Norway 3.5-1.5. Having lost the morning Foursomes much depended on their more experienced Singles line up. Pleasingly they all delivered. Robert MACINYTRE beat Jarle Volden by 2 holes, Liam JOHNSTON halved with Markus Braadlie, Craig HOWIE turned over Kristoffer Reitan by 2 holes and Conor SYME confirmed the unbeaten series with a 1 hole victory over Viktor Hovland. Scotland will play France, the conquerors of Ireland, tomorrow in a match to determine 4th and 5th places. IRELAND lost to France 3-2. Colm CAMPBELL and Robin DAWSON won the Foursomes match but only Conor O’ROURKE could gain a point in the Singles series; he beat Pierre Mazier by 1 hole. Ireland will play Norway tomorrow to see who finishes 7th and 8th. WALES were relegated to Division 2 after a disappointing 3-2 defeat to Belgium today. David BOOTE had to work hard for his 2 holes win over Cedric Van Wassenhove after a shaky start but only Tim HARRY could join him; Tim beat Alan De Bont 4&3. There was a surprising 7&5 loss for Jack DAVIDSON in the final game to Adrien Dumont De Chassart. Wales will hope to beat Switzerland tomorrow to avoid leaving Austria with the wooden spoon. ENGLAND beat France 4-3 in their Flight A Quarter Final. Not for the first time in recent years it was Alfie PLANT who saved the day for the stroke play medalists. Having combined well with Harry ELLIS in the morning Foursomes for a 4&3 win he won the all-important deciding Singles by 1 hole. There were also good Singles wins for Scott GREGORY (3&2) and Matthew JORDAN (5&4) in the afternoon. SCOTLAND, the defending champions, and IRELAND both lost their Quarter Finals and with them any hope of a medal. Scotland left themselves too much to do against Sweden after losing both morning Foursomes. Robert MACINTYRE (4&3), Liam JOHNSTON (4&2) and Connor SYME (4&2) salvaged some pride in the afternoon Singles but ultimately couldn’t prevent a 4-3 defeat. Ireland lost 4.5-2.5 to Italy. Stuart GREHAN and Paul MCBRIDE earned a useful point in the first Foursomes but only Conor O’ROURKE could win his Singles in the afternoon. Italy will now play England in the Semi-Finals. WALES lost their Flight B match 3-2 against home nation Austria. Having lost the morning Foursomes David BOOTE (6&5) and Evan GRIFFITH (5&4) gave the Principality hope enjoying good Singles wins. However, it proved to be in vain as Jack DAVIDSON (1 hole) and Owen EDWARDS (19th) both came out on the wrong side of tight matches. Wales now need to guard against relegation in their remaining consolation fixtures. The first stage of the European Men’s Amateur Team Championship came to a close at the Diamond Country Club in Austria today. WALES (+28) finished 10th and will therefore play in the Flight B match play stage. They must avoid finishing 14th or lower to stay in Division 1. The Flight A match play consists of two morning foursomes games followed by 5 singles whilst the shorter Flight B matches have one foursomes and four singles. Teams continue to play each other over the next three days to determine the exact finishing positions. Great Britain & Ireland’s leading contributors in the stroke play event were Paul MCBRIDE (IRE), Matthew JORDAN (ENG) and Alfie PLANT (ENG) who all finished tied 2nd on -3. Harry ELLIS (ENG) shot the best score of the qualifier; a bogey free 65 (-7) in round 2 which included an eagle and 5 birdies. This helped the 2017 Amateur Champion to a tied 8th individual result on -2. Jack DAVIDSON (Ev / tied 12th) just pipped David BOOTE (+1 / tied 16th) to the top Welsh individual title. Both will be hoping for strong match play performances over the next few days as they press their cases for inclusion in our Walker Cup team. The 34th European Men’s Amateur Team Championship will be played between Tuesday 11th and Saturday 15th July 2017 at Diamond Country Club, Atzenbrugg, in Austria. Amateur teams from England, Ireland, Scotland and Wales will all be competing this week. Scotland are the double defending champions having won at Halmstad Golf Club, Sweden in 2015 and Chantilly, France last year. The European Ladies’, Boys’ and Girls’ Team Championships are also being played elsewhere in Europe this week. The Championship is run by the European Golf Association, this year in association with the Austrian Golf Association. The leading 13 teams from last year’s Division 1 Championship are joined by the host nation (if not otherwise qualified) and 2 or 3 promoted teams from the 2016 Division 2 Championship. Wales were one of the promoted teams last year. Click here to view tomorrow’s – European Men’s Amateur Team Championship Round 1 Stroke Play Draw. Additionally the teams finishing 14th to 16th in the stroke play stage will be relegated to the Division 2 Championship for 2018. The teams competing in the 2017 Championship are Austria, Belgium, Czech Republic, Denmark, England, France, Germany, Iceland, Ireland, Italy, Norway, Scotland, Spain, Sweden and Switzerland and Wales. Czech Republic, Iceland and Wales were all promoted to the Division 1 Championship this year. ENGLAND – Harry ELLIS, Scott GREGORY, Josh HILLEARD, Matthew JORDAN, Gian-Marco PETROZZI, and Alfie PLANT. IRELAND – Colm CAMPBELL, Robin DAWSON, John Ross GALBRIATH, Stuart GREHAN, Paul MCBRIDE and Conor O’ROURKE. SCOTLAND – Craig HOWIE, Liam JOHNSTON, Ryan LUMSDEN, Robert MACINTYRE, Jamie STEWART and Connor SYME. WALES – David BOOTE, Ben CHAMBERLAIN, Jack DAVIDSON, Owen EDWARDS, Evan GRIFFITH and Tim HARRY. In this Walker Cup year it will be interesting to see which players qualify well, who is paired together in the foursomes and finally how some of the singles pan out in the match play stage. 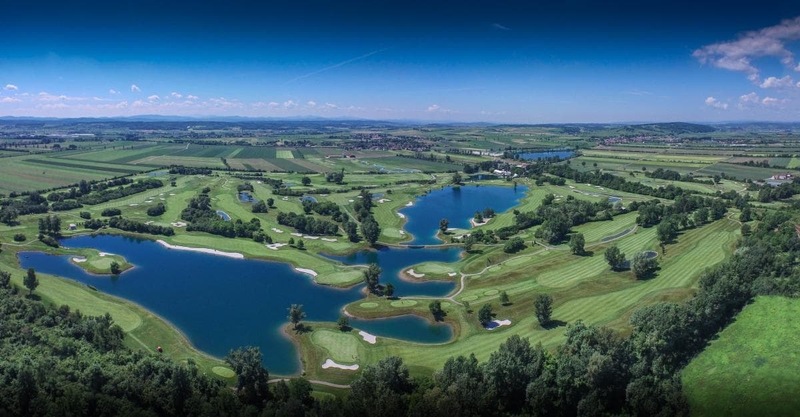 The Diamond Country Club is generally accepted as being Austria’s best golf course. It has hosted the Lyoness Open on the European Tour for many years and has recently extended this agreement until 2020. It hosted the European Boys’ Team Championship last year. The Diamond Country Club’s 18-hole championship course was created by Jeremy Pern. It is a parkland layout with numerous water hazards. It plays to 7,458 yards and a standard par of 72. Tue 11th July – Showers. Wind 10mph W. Temp. Max. 28°C / Min 21°C. Wed 12th July – Sunny. Wind 6mph S. Temp. Max. 30°C / Min 20°C. Thur 13th July – Sunny. Wind 14mph NW. Temp. Max. 24°C / Min 15°C. Fri 14th July – Cloudy. Wind 7mph E. Temp. Max. 24°C / Min 17°C. Sat 15th July – Cloudy. Wind 11mph N. Temp. Max. 23°C / Min 16°C. 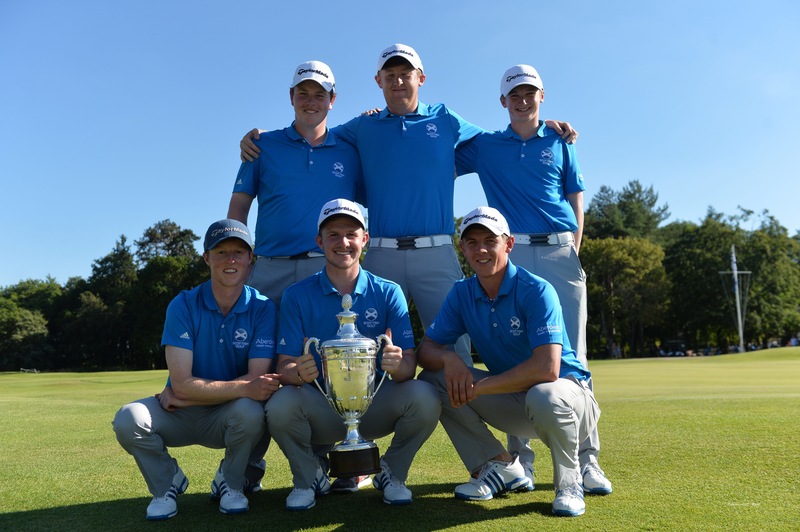 Scotland retained the Team Championship title at Golf de Chantilly in France with a 5-2 victory over Sweden in the final. Scotland qualified 2nd on count back behind France with a 713 (+3) aggregate team score. Prior to beating Sweden, Scotland despatched Spain 5.5-1.5 in their match play quarter final and Italy 5-2 in the semi finals. Ireland, who qualified in 6th place on 720 (+10), lost their Flight A quarter final match 4.5-2.5 to Italy. They eventually finished 6th after beating Spain (3.5-1.5) but losing to France (4-1) in the consolation matches. England had a disappointing tournament, initially qualifying in 10th place on 728 (+18). They then lost 3-2 to Switzerland in the Flight B match play before regaining some pride by beating Portugal (4.5-0.5) and Netherlands (3.5-1.5) to retain their Division 1 status with a 13th place finish. Wales were promoted in the Division 2 competition led by a near perfect display by David BOOTE.